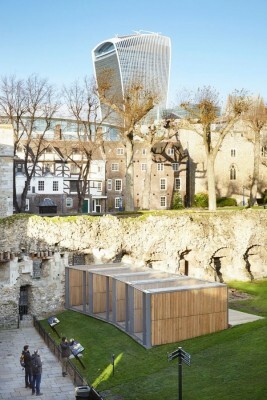 Llowarch Llowarch Architects has completed a new enclosure for the legendary Ravens at HM Tower of London. Perched on the edge of a grassy slope, in the Tower’s inner most ward, the new 500 sq. 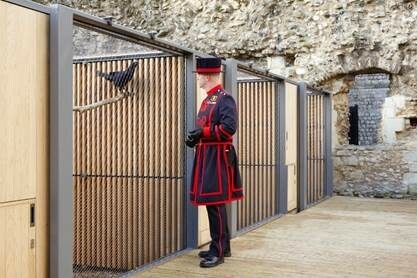 ft. timber structure is an elegant and appropriate new home for the birds, and an excellent opportunity for visitors to get up close to the ravens which are one of the Tower’s most popular attractions. The ravens’ former accommodation had reached the end of its serviceable life. 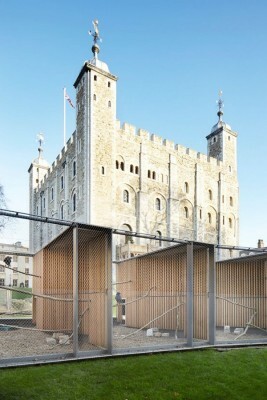 Historic Royal Palaces, the independent charity that cares for the Tower, commissioned architects Llowarch Llowarch to create a new enclosure that would address the public, and bring improvements to the animals’ welfare and comfort. Providing the birds with a safe and comfortable habitat is also of national importance as legend tells that the Kingdom will fall if the ravens ever leave the Tower. Nicola Llowarch says “Ravens are highly intelligent birds. Unlike an aviary, the birds have free rein of the Tower during the day. 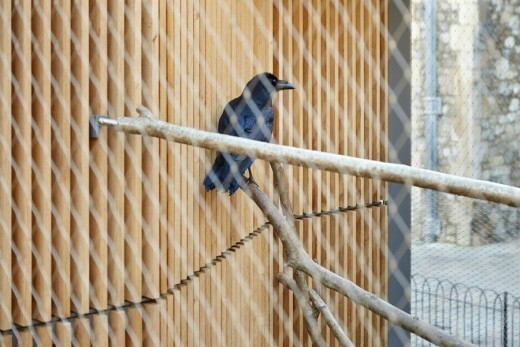 Openings in the rear of the new enclosures allow the ravens free access to come and go. At night these are closed for the ravens’ own protection. Given their status as a top attraction, the ravens also needed to be highly visible. An important premise was that the birds should be seen against the backdrop of the historic setting, hence maintaining transparency through the enclosure was important. 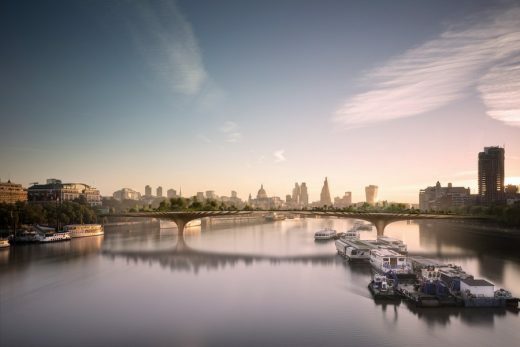 The new enclosures also had to be sensitive and appropriate to the setting – a UNESCO World Heritage Site, Scheduled Ancient Monument, and Grade I listed structures. We worked closely with the Ravenmaster, HM Tower of London, and with specialist input from the Zoological Manager and Curator of Birds, ZSL London Zoo. It’s been fascinating. I now know some of the ravens by name, and their different habits and personalities – there is one that likes to play dead which is a little alarming!“. 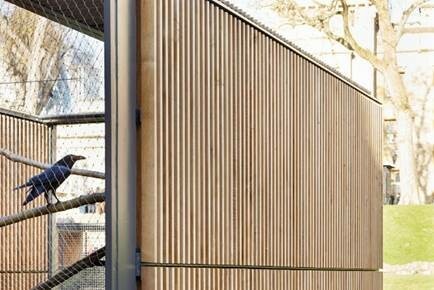 The completed enclosure comprises a series of oak slatted structures running perpendicular to the grass slope. The oak structures contain the ravens’ sleeping boxes. The open spaces between are covered by ultra-fine stainless steel mesh creating four secure recreation areas for the birds. 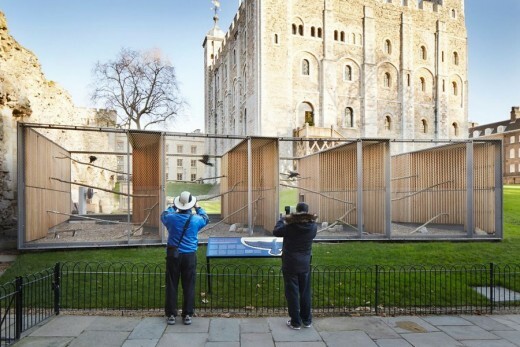 When viewed from the front, the simple but highly crafted wood structures frame the birds in their setting, presenting them against the backdrop of the iconic White Tower. Large sliding screens to the rear provide access to the open sections of the enclosures whilst maintaining transparency through. “Restrained detailing” was a key element in Llowarch Llowarch’s approach. The enclosure’s design evolved through a series of models at various scales, an intentional process of repeated studies of simplification and refinement aiming to minimise the impact of the structure in this historic setting. Vertical oak slats bring an implied translucency in contrast to the stone boundary, as well as bringing an intimacy of scale and texture. A restrained palette of oak and stainless steel netting makes the enclosure a sensitive and appropriate addition to the World Heritage Site. 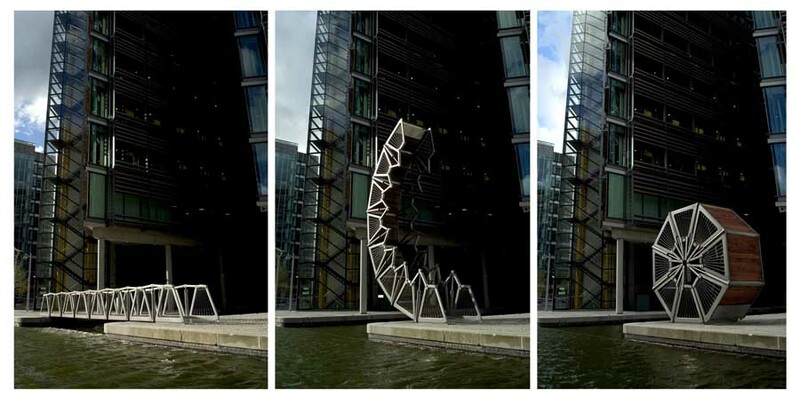 The architect’s selection of materials references their historic use at the Tower. 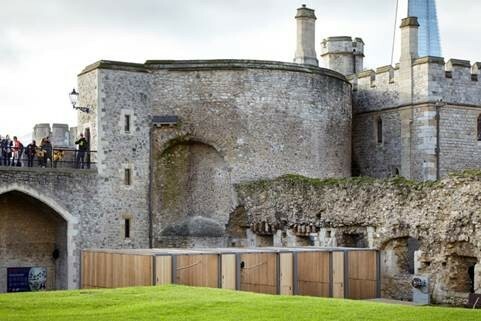 Timber structures are believed to have occupied the site before the expansion of the Royal Lodgings beyond the White Tower in the thirteenth century. The Raven Enclosure was designed to exaggerate the innate qualities of each material and the architects worked very closely with the craftsmen in a collaborative process of making and approval which involved regular visits to the manufactures workshop rather than the traditional, more distant process of reviewing and approving shop drawings. 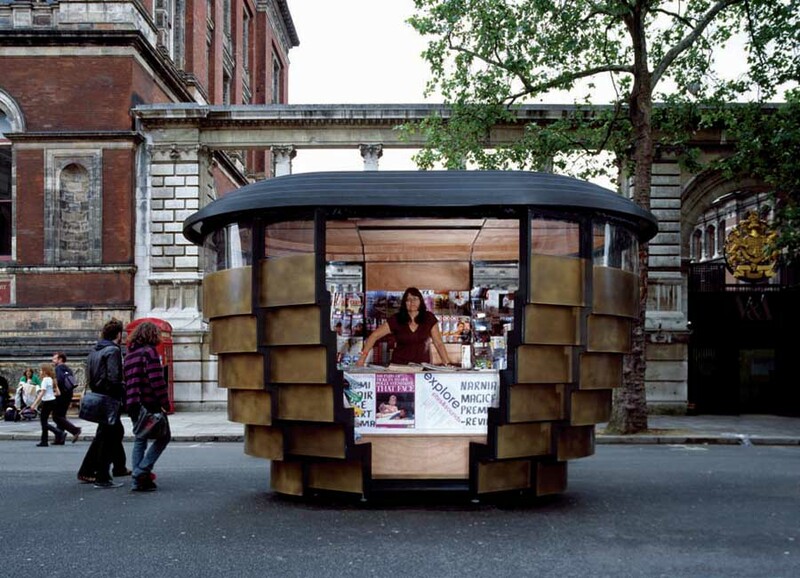 In line with the brief, a new timber deck provides space for expanded programme of educational talks and workshops. The roof is also an important elevation as the enclosure is highly visible from the Wall Walk and White Tower steps. Contextually its height continues in line with the plateau of the lawn over the Ravens Shop adjacent. 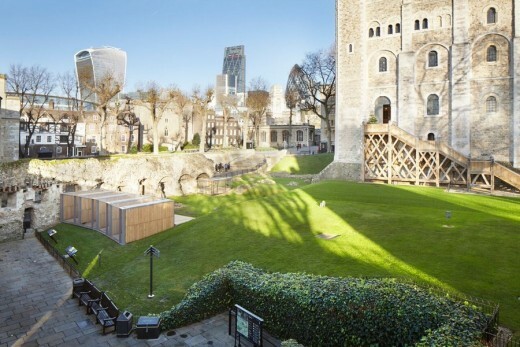 HRP commissioned the works as part of an on-going programme of improvements to the visitor experience at HM Tower of London where the Tower Ravens are one of a number of prime attractions for visitors to the Tower.